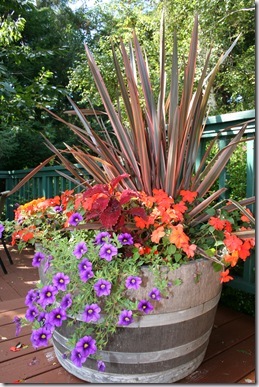 A client came up with this pretty container planting idea for summer and fall. 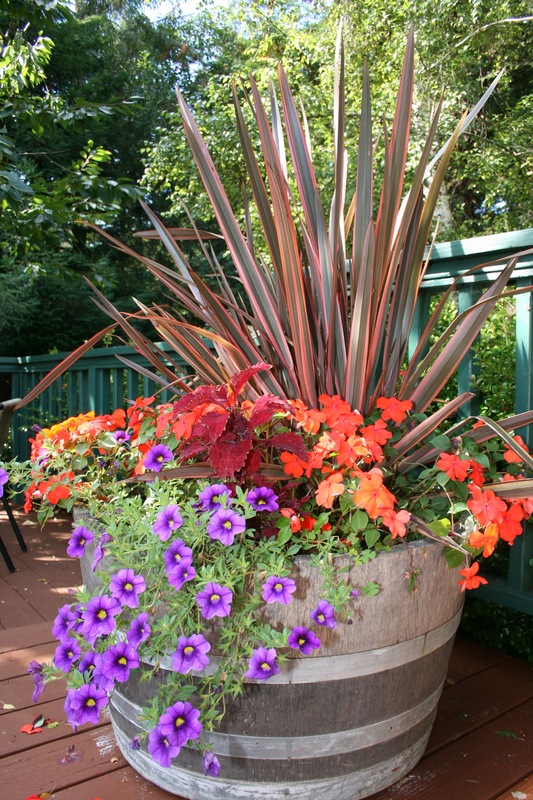 The spiky Phormium/ Flax Grass makes a vivid centerpiece, then she used red Coleus and orange Impatiens to pick up on the Flax’s colored stripes. Last, she used some purple trailing Petunias to cool down the combination and spill over the edges. A thriller is a pretty self explanatory; it’s a gorgeous plant that is the focal point of the container. Fillers highlight or compliment the thrillers and fill up the pot so it doesn’t look bare. Spillers cascade over the side of the pot to add interest and soften the edges of the container. Of course, everything but the Flax will die down for winter, so if you had this combo going through fall, you’d want to pop in some Paludosum Daisies, ‘Bright Lights’ Swiss Chard, ‘Zeolights’ Calendula, or other winter annuals and greens to cheer up your Flax Grass as the flowers die back. I like your client’s combo for her container. The colors work well for summer or fall. Here in CT I’m thinking about my fall/winter containers. This year I’ll use Gaultheria (Wintergreen) and Arctostaphylos (Bearberry) for texture and their colorful berries and then in the spring I’ll plant them in my garden as groundcover. .-= Debbie´s last blog ..First Frost Date in Connecticut =-. Debbie, that sounds lovely! Berries are awesome in winter, aren’t they? I love being able to use plants in containers for a season or two and then plant them out in the garden, it seems to work so much better than trying to prune roots and shoots to keep something in a pot indefinitely. .-= Monica the Garden Faerie´s last blog ..Fantabulous Fall Foliage =-. Those are the biggest Calibrachoa flowers I’ve ever seen, is that a new cultivar? Or is that a very small phormium?! Lovely combo, would be cool to tuck a few bulbs in it too! .-= Laura Livengood Schaub (InterLeafer)´s last blog ..California Fallishness =-. Nice a dramatic – just the way I like it! .-= Susan (garden-chick)´s last blog ..Tweeters and Gardens and Swag, Oh My! =-.